This guide will help explain how to create a session in the Android App. To create a session go to the sessions tab in menu. In the top right hand corner there are three dots that will open up some options. Select New Session. The next step after the details is to choose which coaches and athletes you'd like to attend the session. 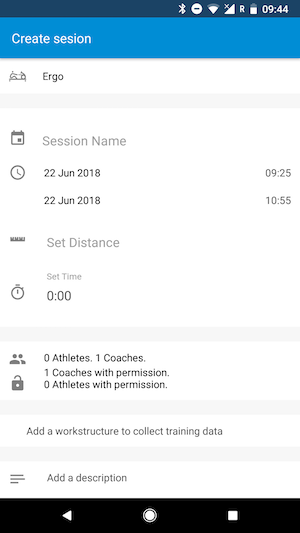 Once you select an athlete or coach you are given the option to add permissions to the user. If you want to collect data such as times from an ergo or a race on the water you will need to create a work structure to collect data. There are 4 types of data structures that you can create. The work structure is flexible and allows you to pick the type of data you would like to record on a session. The final section of the create session flow is more details. More details allows you to add additional details to the session. * These sections are not required to create a session.